As there are always writers and fans who are curious about the work methods and gear of authors, I decided to show off my workstation. Warning: this article has a high ‘gearhead’ ratio, so proceed at your own risk. 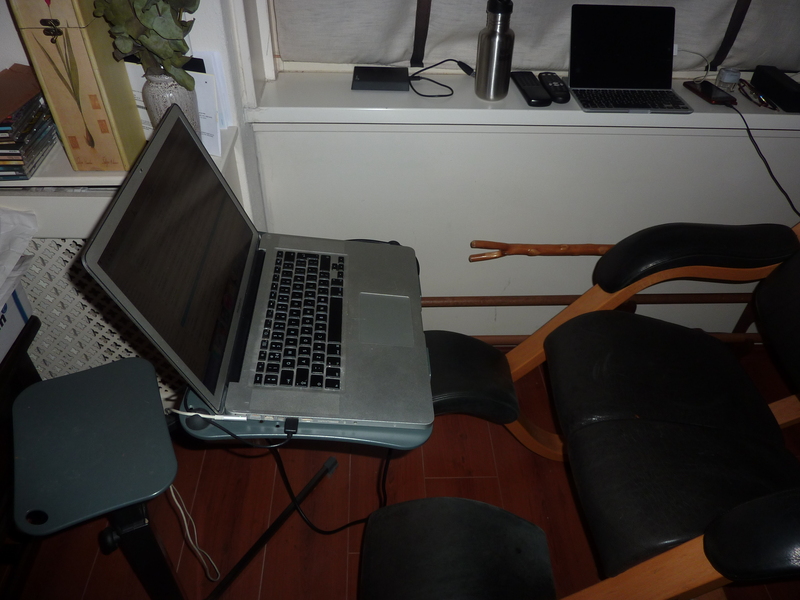 This is my workstation when I write at home, i.e. my stationary station. 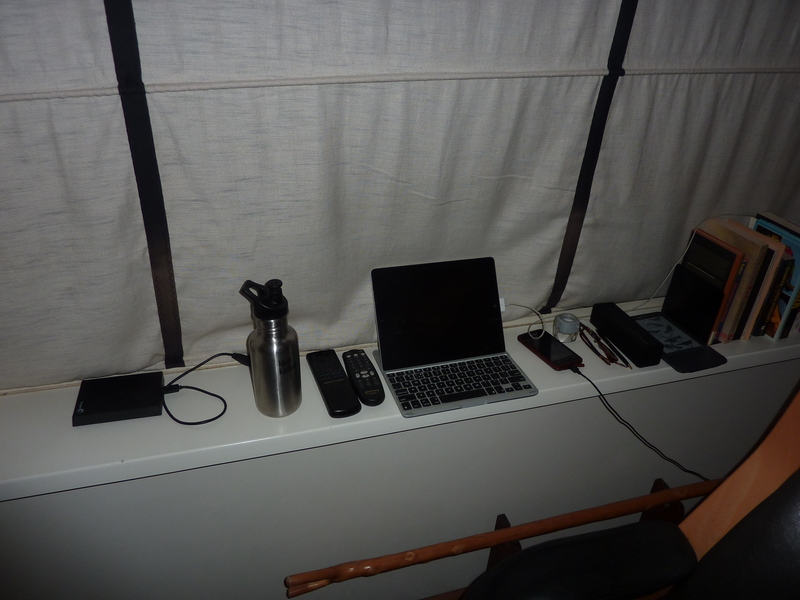 I also have a set-up for ‘on-the-go’ (which can be briefly seen here), but I’ll come back to that in another article. When I write at home, I sit in the living room, street side. My living room doubles as a dojo (and a playroom for the kids), which explains the sword rack and the judo mats on the floor… In the picture, the curtain is down, but during the day I often have the curtain raised to let the sun in. The lower parts of the window are frosted so people won’t be able to see inside (and I don’t spend my valuable writing time gazing outside). My throne is a vintage Stokke Gravity Balance (currently manufactured by Varier). I fell in love with this chair when it first came out in 1987, but it was always hideously expensive. I bought this Stokke chair secondhand for four hundred euro. That might sound like a lot of money for a secondhand chair, but these chairs are built to last. The 2014 price for a Varier Gravity Balance with black leather upholstering starts at twenty-three hundred euro, so four hundred euro is a bargain. The leather was faded, but I managed to get it black and shiny again. 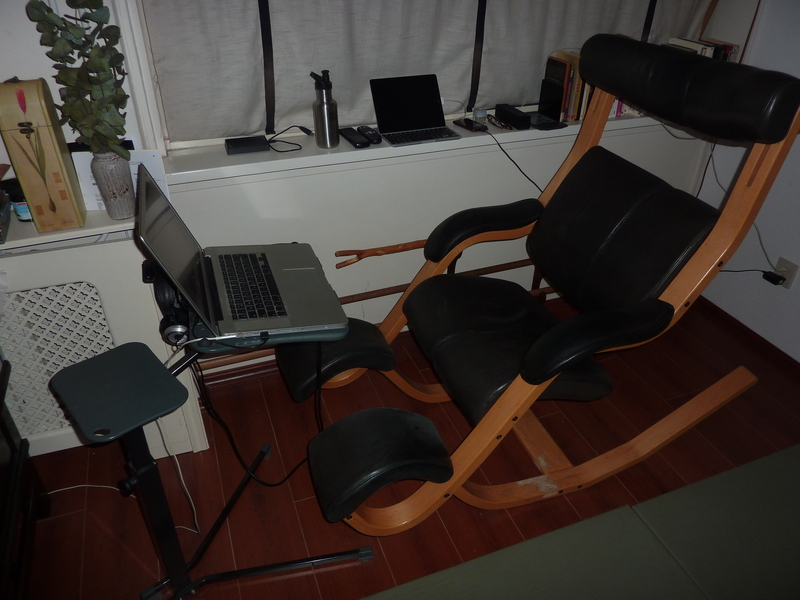 When writing, I rest my knees on the two lower pads (with my feet tucked under the seat) and the wooden curves rest on the ground, so the seat is tilted forward. This is an active seating position that fosters a tilted pelvis and a straightened spine. 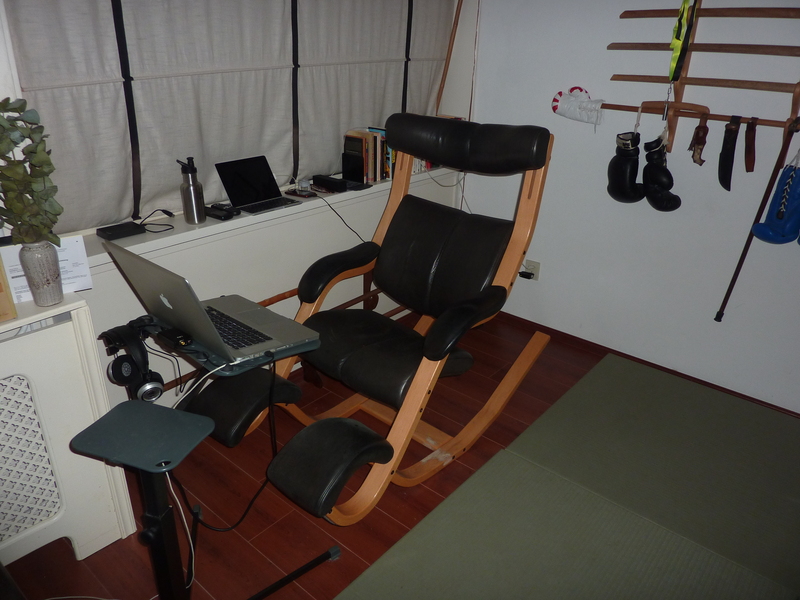 When researching/reading/watching films, the seat will be in the neutral position (like in the picture). In this position, my feet are often between the two pads or on the left pad. Listening to music, I lean back into the reclining position and put my calves on the knee pads. In this position I often sit while thinking up new scenes for my books. Finally, I can push off and tilt all the way back into the ‘zero gravity‘ position. This fully reclining position can be used for napping. The legs, on the knee pads, are elevated above the torso, so the blood flows down to the abdomen. My 15” MacBook Pro rests on a Lounge-Tek book table. The laptop platform can be tilted and swivel 360 degrees, and is fixed with an angled rod to the main post. 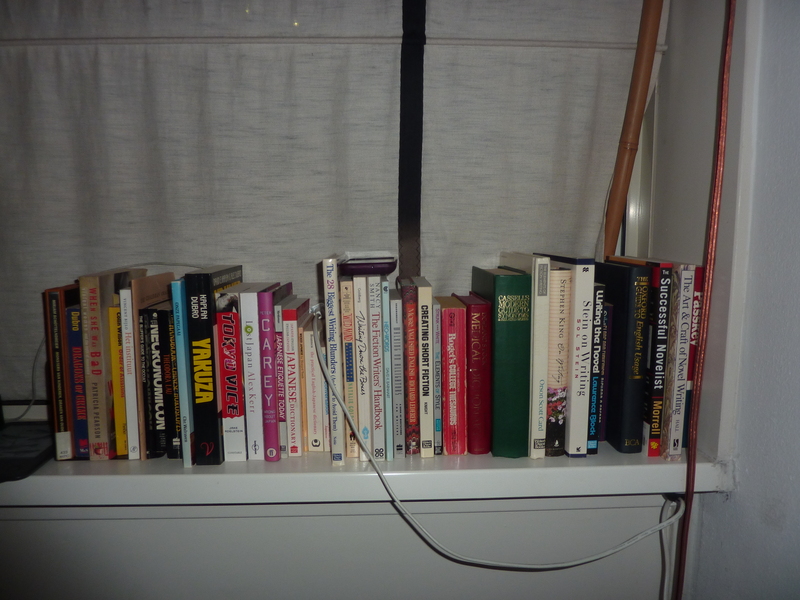 On top of the main post is a smaller flat platform where I often place the covers of DVDs and CDs. The height adjustable post stands on two angled feet with hard plastic feet. The sturdy Lounge-Tek table is light enough to push and pull, but stable enough not to drop collapse with my expensive stuff on it. I’ve had this table for a couple of years now (it can easily used in beds or with couches that have a small gap where the feet slide under). I always play music when I’m creating. Up until a month ago, I used a Grado SR60i headphone, which functions pretty good with the iPad, but only pretty well with the MacBook and just adequate with my stereo. Since Grado has updated its line of headphones, I could get a sweet deal on a Grado SR325iS, which is a giant leap from the 60, but also a bit harder to drive. Hence the FiiO E10K Amp/DAC. So what does the FiiO do? While the signal from the headphone socket of the MacBook is pretty good, the E10K’s Digital to Analogue Converter connects to the USB port, where it both draws its power and converts the digital iTunes signal to analogue (sound) using an external sound card that is quite a lot better than the internal sound card of the MacBook. 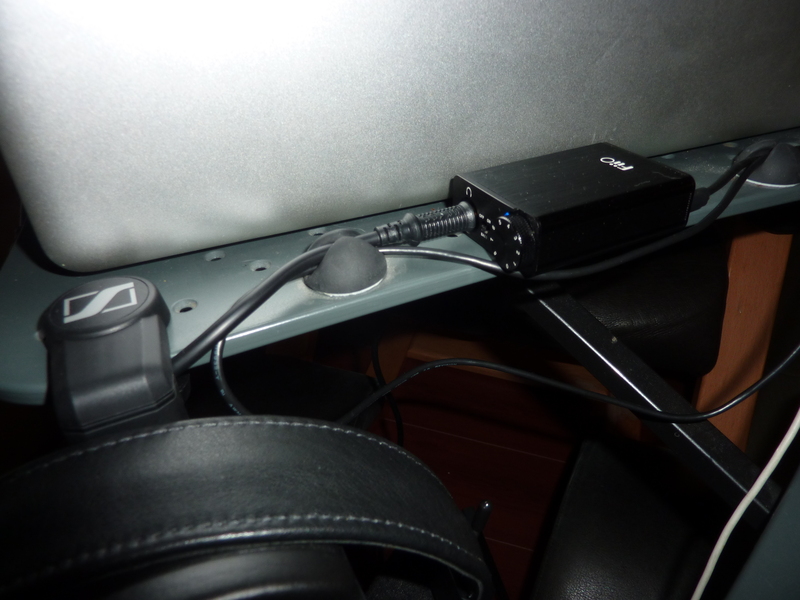 On top of that, the FiiO has a pretty powerful amp that can power 16-150 Ohm impedance headphones. As the SR325iS is 32 Ohm, the FiiO has no problem enhancing and amplifying the iTunes signal to near Compact Disc quality for the headphones. The E10K also has a Bass Boost switch and a low/high gain switch, as well as an analog and digital line-out. The headphone jack is coupled to the potentiometer to adjust the volume. 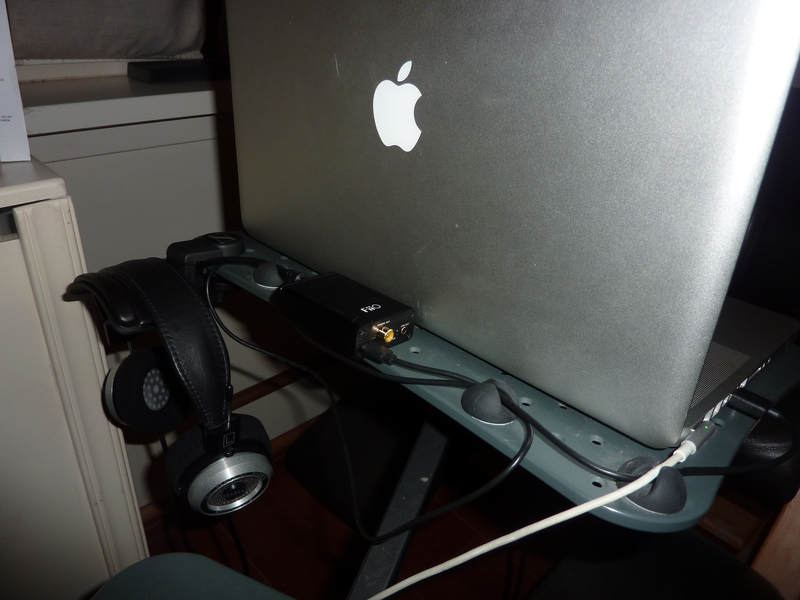 To protect and store these high-end headphones I found a Sennheiser HH10 padded headphone support that clamps onto the laptop platform. Of course I have other gear that doesn’t belong on the laptop platform, but still has to be within reach. From Left to Right: Seagate 1TB hard drive for back-ups, Klean Kanteen water bottle, remotes for when I listen to my stereo instead of my MacBook, my trusty iPad2 with bluetooth ZAGGkeys ProPlus keyboard for writing ‘on-the-go’, Samsung mobile phone, magnifier, reading glasses, pen, Kindle e-reader. Every writer has reference works. These are non-fiction books on a variety of topics like crime, weapons, and psychology; and reference books on writing, medical terminology, grammar and proper usage. That concludes the tour. If you feel like supporting me and help me to keep writing and publishing, head on over to the main page for links to the retailers that sell the Amsterdam Assassin Series. Please comment if you want to discuss my set-up or your own.